Closings have commenced! This exceptional 4 bedroom, 4 bathroom residence offers 3,115 square feet of living and entertaining space, with an additional 418 sqft private terrace overlooking the river. Expansive north, east and south-facing exposures offer open views of the city and East River. 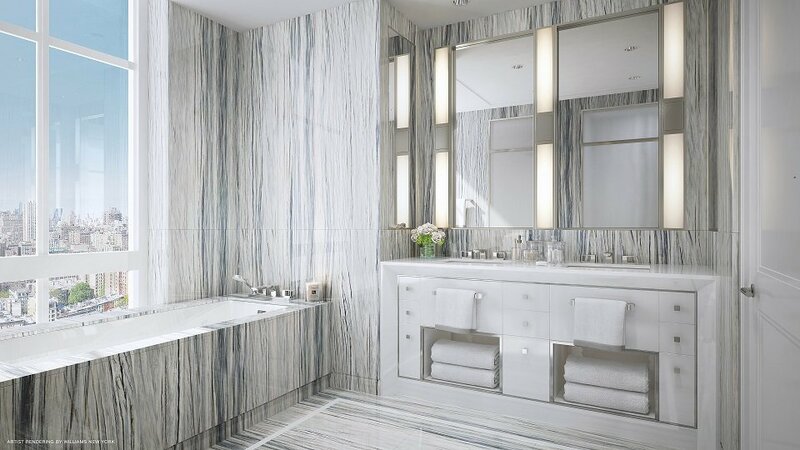 Extell Development Company is proud to present The Kent, a tailored collection of elegantly appointed condominium residences on the Upper East Side, crafted by award-winning architects Beyer Blinder Belle and acclaimed interior designer Alexandra Champalimaud. Two-to-five bedroom gracious residences exhibit the finest finishing details, complemented by three levels of curated indoor and outdoor services and amenities. The Kent Service and Amenities: - Grand Lobby with concierge desk - 24-hour Doorman - Stroller Valet - Lobby cold storage room for fresh food and flower deliveries - The Drawing Room" Lobby Lounge with fireplace and bar - 55-foot indoor heated swimming pool - Private State-of-the-Art Fitness Center - Men's and Women's changing rooms with Finnish saunas - "The Sound Lounge" by Kravitz Design, envisioned by Lenny Kravitz - Camp Kent children's playroom designed by Williams New York - Outdoor children's play area designed by West 8 Urban Design & Landscape Architecture - "The Garden Salon" residents' lounge with fireplace, billiards table, catering kitchen - Landscaped courtyard garden designed by West 8 Urban Design & Landscape Architecture - Canine Spa - Bike Room Eligible for 20-year 421A Tax Abatement. The complete offering terms are in an offering plan available from Sponsor. File No. CD15-0238. Sponsor: 95th and Third LLC, 805 Third Avenue, Seventh Floor, New York, NY 10022. Sponsor reserves the right to make changes in accordance with the terms of the offering plan. Equal Housing Opportunity.